The Aero Knit men's tennis shoes are the most lightweight and dynamic of the K-Swiss family: the Infi-Knit upper is made of breathable seamless fabric and hides the lacing system, while the Surge midsole offers cushioning and optimal energy return. The Aosta 7.0 sole is resistant, flexible and durable, adapt to all playing surfaces. 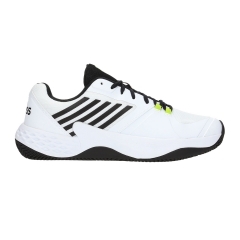 Recommended for dynamic players looking for support and versatility on the court without giving up lightweight and comfort. Made of interlocking fibers that grip the sock to minimize heel slippage. Patented Sole, made of open cell foam, that makes it highly breathable with great humidity regulation, to keep the feet fresh and dry. 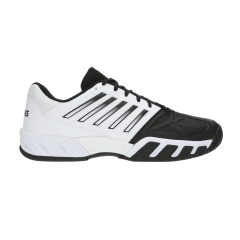 Besides comfort, it offers cushioning and elevated bounce, with an elasticity rating over 40%.